Shopkins Live! Shop It Up! Ticket Giveaway + Interview with the Director | YAYOMG! Shopkins fans, it’s time to get psyched! 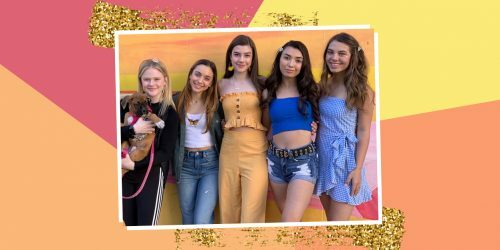 The Shoppies are going on tour, and we’ve got your chance to win tickets for you and your friends and family to see the show! 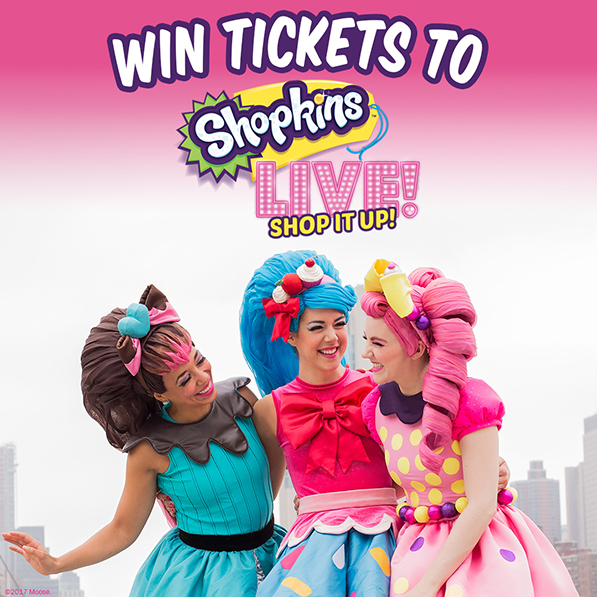 In their first ever North American tour, Shopkins Live! 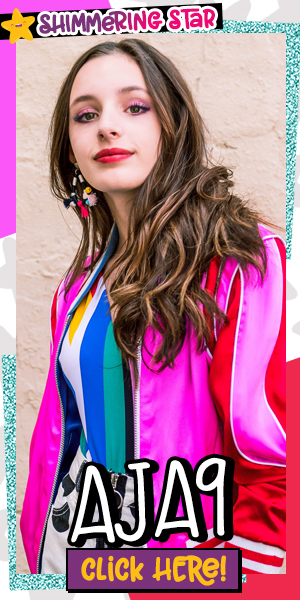 Shop It Up!, all your favorite Shoppies are hitting the stage to bring the world of Shopkins to life in an epic night of catchy pop music, amazing dance moves, fabulous fashion, and total cuteness. There’s going to be incredible costumes, state of the art theatrics, and non-stop fun. Watch the trailer here! What can you expect from the show? We interviewed Patti Caplette, Writer and Director of Shopkins Live! Shop It Up! to bring you guys extra special insight into what goes into planning a show as fun and big as this one! YAYOMG! : What’s involved in putting together a show like Shopkins Live! Shop It Up!? PATTI CAPLETTE: OM double G! It’s like building a small village! First, I have to hatch an idea, a concept for the show that will embrace both the Shopkins brand, as well as become a great piece of theatre! The writing of the script is the first step. YAYOMG! : Can you share a little on the process of how a live show is created and your work as the director? PATTI: There are so many moving parts, different creative and technical people working separately at first, and then merging together the closer it comes to the premiere! As Director, I must interact with them all, slowing guiding them towards a common vision which I must hold tightly; kind of like a captain on a ship. I work with the composers, the scenic designer, and the wardrobe, the recording of the character vocals, the singers, actors, and dancers. Whew, I’m tired just thinking about it! But I love it! It’s pure magic. YAYOMG! : What can fans expect from the show when they attend this Fall? PATTI: Magic! A feast for the senses! The inspired sets, amazing colorful costumes, hip hop choreography, and live singing to newly created pop tunes will have everyone engaged. The 90 minute energetic theatrical is anchored in friendship, but wrapped in fashion and fun! It’s Shopkins! What’s not to love? YAYOMG! : What’s goes into transforming a Shoppie from an iconic doll to a character on a stage? PATTI: The Shoppies cast is amazing and when they step on stage I’m fully expecting oohs and aahs. There were many decisions to make, like how to re-create the amazing hair styles of the Shoppies that will last a very busy touring schedule. I think we have come up with something brilliant! Footwear too, is a challenge because of the shape of the Shoppies feet. But my team are well on their way to solving all tasks. YAYOMG! : Do you have a favorite moment from working on Shopkins Live! so far? PATTI: So far, watching the costumes and music come to life, where I can actually ‘see’ and ‘hear’ them! But it’s usually when the cast is finally assembled and we go into rehearsals, which is a month prior to premiere. I’m so pumped for that moment! YAYOMG! : Will there be any exclusive Shopkins or Shoppies fans can pick up at the merch booth? 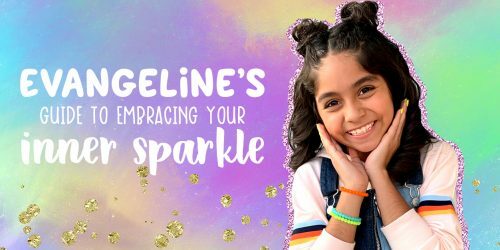 PATTI: Yes – there will be exclusive Shopkins Live! merchandise only available at the show! and I’ll be first in line! Sounds like it’s going to be the best show EVER! Want to win tickets? 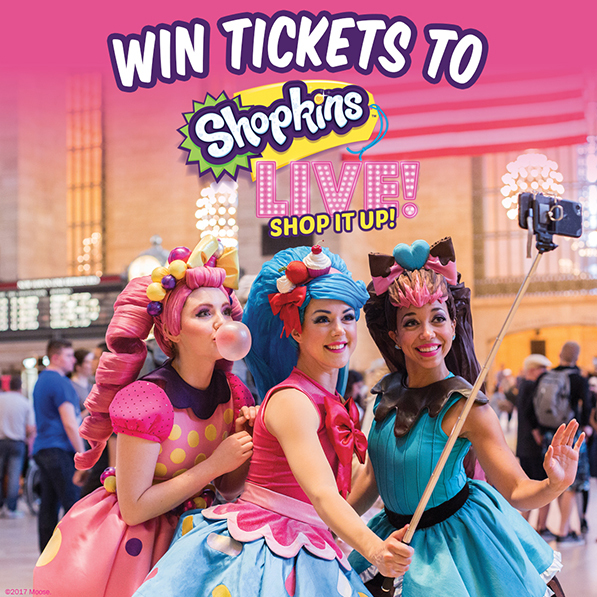 Grab a parent and fill out the form below for your chance to win a Family 4-Pack of Shopkins Live! Shop It Up! tickets in the US city of your choice. 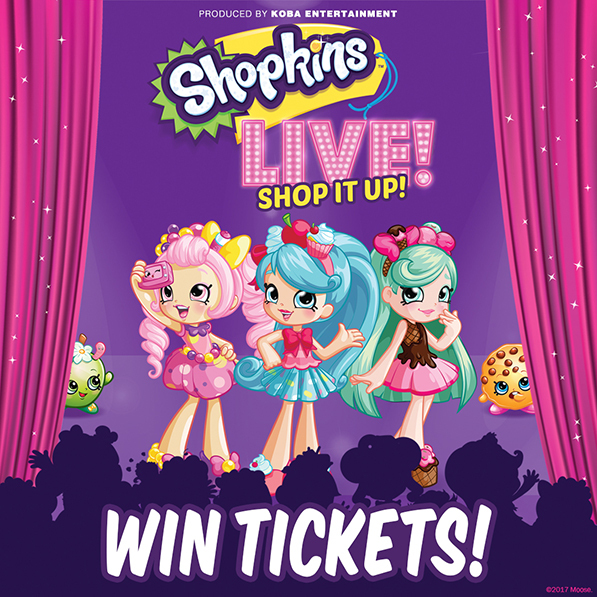 One (1) lucky winner will receive a Family 4-Pack of tickets to see Shopkins Live! Shop It Up! in the US city of their choice, provided by Koba Entertainment. Tickets will be made available at Will Call at the venue and date of your show. Fill out the form by 8/1/17 at 11:59pm. Giveaway begins on July 18th, 2017 at 2pm EST and ends on August 1st, 2017 at 11:59pm EST. You MUST include the city of the Shopkins Live! Shop It Up! show you’d like to attend in order to be eligible to win. All tour dates are listed here. Good luck to all the entrants! We’re rooting for you and we’re sure the Shoppies are too! For more info about the show, head to shopkinslive.com!